As of yesterday, Dexter Ian is 11 months old. 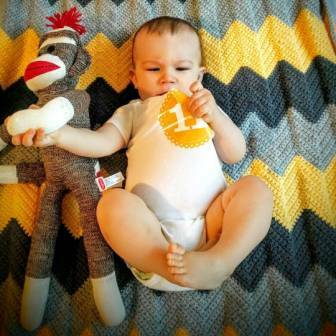 I just want to be sure everyone is aware that 11 months is just one month away from ONE YEAR OLD. Please direct me to the office where I can file a complaint regarding the too-rapid passage of time. I’m aware that kids like toys and that’s why they exist, but Dexter really loves toys, playing and exploring with impressive energy and creativity. He has four teeth now and plays Level 4 peek-a-boo, where he covers his face with his own hands. Sometimes he mostly misses, which is hilarious. (“Where’s Dexter? Oh. He’s right there.”) His favorite things are being upside down, cracking himself up by sticking his pacifier in mommy’s or daddy’s mouth and crawling up the stairs then taking off in a sprint-crawl, giggling wildly, giddy with freedom. Our morning routine right now is that I get up and make a bottle while Matt grabs Dex out of his crib and entertains him until milk is ready. Every day, my not-a-snuggler baby practically flings himself out of Matt’s arms when he sees me because for some reason, he not only deigns to hug me for a whole 15 seconds every morning but he seems to really, really crave it. So do I, kid. Thank you for the best 15 seconds of my day.